Buffy's emotions run high after the tragic loss of her mother, but she can't mourn long, as the Hellmouth never sleeps. In Tom Fassbender, Jim Pascoe, and Cliff Richard's Ugly Little Monsters, the Slayer must contend with deformed demon-children, a volatile teenage sister, and a lovestruck vampire named Spike. 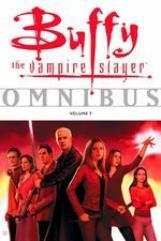 Troubled by visions of monsters fought and of those to come, Buffy must sacrifice herself for Dawn, and her death takes a toll on the Scooby Gang. Without their Slayer, these close friends must band together and confront demons, reptilian sorcerers, and crazed forest creatures in stories written by Amber (Tara) Benson, acclaimed Buffy novelist Christopher Golden, and TV writer Jane Espenson, who presents the secret Season Six rendezvous between Buffy and Angel through the imaginations of the Slayer's closest friends. The original series reaches its grand finale with the gang re-united and going on a long trip to hell where Angel, Faith, and Oz return to Buffy's life.